Nielsen recently released the Q1 09 edition of their series of A2/M2 Three Screen Reports on usage of TV, DVR, online video and mobile video (you can download the latest PDF here). I’ve run some calculations against that data – see below for charts and the trends they indicate. And just in time to raise my ire in this newsletter, on Thursday the Wall St. Journal ran this article – More Households Cut the Cord on Cable (going online video only). Reading it, I began to feel like an advanced video colleague of the unintelligible cranky prospector from Mel Brooks’ "Blazing Saddles." Because while cord cutting may make for an attention getting tech meme, right now it’s an over-hyped trend in a small number of households that simply isn’t showing up in the quantitative data. The recent Nielsen report is one more source that shows it’s not having a measurable impact on TV consumption in the US. Meanwhile, there is a platform that is having a measurable impact on TV right now – it’s DVR (see below for the metrics). It’s true that cable is slowly but steadily losing subscribers (and losing TV household market share even faster – see this edition of the newsletter for those metrics). But adoption of satellite TV and IPTV is more than making up for that – the total number of people subscribing to multi-channel TV continues to rise. Certainly, technology solutions that provide mass-market consumer friendly, high quality "Internet video to TV" are clearly coming. But whether or not that leads to widespread "cord cutting" (a terrible term for this) will depend on shifts in content distribution, business practices and consumer behavior, not just technology. An example of a current roadblock – you lose access to much of TV programming if you "cord cut" – for a look at this see the newsletter issue "Indexing Cord Cut-ability – How Much TV Do You Lose Going Online-Only?" The reports focus on average per person usage, but I wanted to know what the reports had to say about total viewing of on each of the platforms. I ran some calculations – here’s a chart of total TV consumption (on a person hours basis). TV consumption continues to go up. You do see seasonality in spring and summer (turn off that TV and get out of the house!) and Q1 08 was potentially diminished by the writer’s strike. But for the past three quarters we’re seeing year over year increases. Cord cutting, where are you? 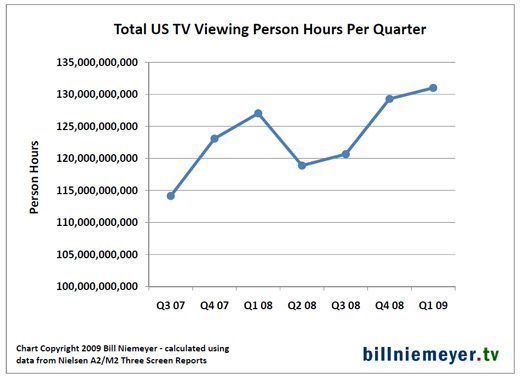 Here’s a chart of those calculations, as a percent of total TV viewing. What can we infer about future trends from this Nielsen data? Mobile is the fastest growing video platform – usage up 166% in Q2 09 vs. Q1 08. But some of that growth could well be issues in the very nascent business of measuring mobile video. 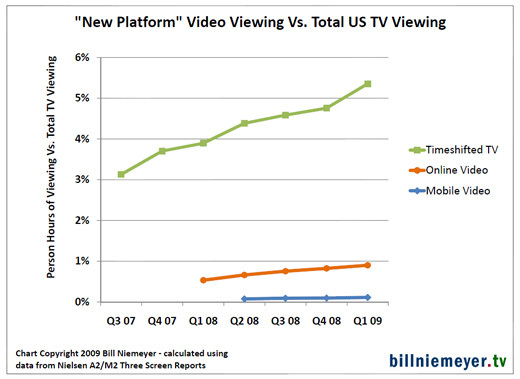 And at 0.1% of TV usage, mobile has some way to go before it can be a notable contributor. Online video is growing quickly – usage up 74% in Q1 09 vs. a year ago. But… timeshifted TV use is growing quickly too – usage up 42% in Q1 09 vs. Q1 08. This is the big challenge for TV networks and stations trying to use online video to replace revenues lost due to DVR ad skipping. While online video is growing quickly, DVR use is not a stationary target. Plus, DVRs are the best thing to happen to TV watching since color TV and the remote. It’s a high quality, easy to get, moderate cost on-demand platform with access to 100% of TV shows. You might be saying… 5.4% DVR timeshifting is still not that much compared to overall TV use. Especially considering that about 40% of ads in timeshifted viewing are viewed in real time within three days and programmers therefore can be paid for them. But that 5.4% timeshifting is the share of all TV viewing in all dayparts in all age cohorts. People 65 and over are skewing that number down – they only timeshifted 2.1% of their viewing, but they represent a remarkable 23% of all TV viewing. In the age ranges and programming categories that matter most to TV ad buyers, DVR timeshifting gets bigger (and in some cases – very big). 48% – for a "special" episode of NBC’s "The Office"
44% – for FOX’s "Terminator"
42% – for ABC’s "Lost"
While an overall 5.4% of all TV viewing being timeshifted may not seem like a large impact, almost 50% of "The Office" episode’s 18-49 viewing being timeshifted absolutely is. Given "The Office" (and most of primetime broadcast) is likely sold against 18-49 C3 ratings (commercial three day), NBC probably saw almost 30% of the ad inventory in that episode wiped out by DVR timeshifting. It’s only going to get bigger. We’re currently at 31% of US households having DVRs – my estimate is we’ll hit 50% at the end of 2011. While TV programmers and advertisers absolutely need to pursue initiatives in online and mobile video, and prepare for "cord cutting"/"over the top" delivery models, they also need to act with regards to their biggest "new platform" impact today – DVR timeshifting. To do this, they need the cooperation of multichannel operators (cable, satellite and telco IPTV) to enable enhanced DVR advertising – not only to mitigate the ad revenue losses but to leverage timeshifted viewing to drive increased advertising revenues. excellent work in this article. nice work.